There seems to be a fair bit of confusion regarding the 100th Regiment of Foot--and a great amount of misinformation. The 100th (County of Dublin) Regiment was raised in 1804 and was shipped to Canada in the autumn of 1805. While some of the soldiers were of English or Scottish extraction, over half were recruited in Ulster A severe storm off the coast of Nova Scotia sunk several of the transports and others managed to reach local fishing ports in various states of damage resulting in a heavy loss of life among the troops. The survivors were eventually carried in other ships to Quebec City. In 1807 the regiment was distributed in Lower Canada to garrison a number of stations including Quebec and Montreal. On May 2, 1812 the regimental name was changed to "HRH Prince Regent's County of Dublin". 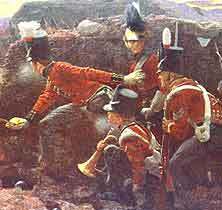 At the outbreak of hostilities with the United States in 1812, a scheduled rotation of the 100th regiment to Bermuda was cancelled. Initially involved in raids in northern New York State, l the regiment was moved to the Niagara frontier where the main American invasion was expected. Headquartered at Fort George, Niagara-on-the-Lake, the companies were stationed from there to the Lake Erie shore as forward detachments. The regiment took a leading role in the capture of Fort Niagara in December 1813. A unit led by Sergeant Andrew Spearman (who settled in Richmond) approached the fort by stealth and captured a forward sentry and forced him to give up the password. They then reached the gates of the fort and, using the password, gained entry. The main body of troops stormed the fort and the fort was taken with very few casualties. At the close of hostilities in 1814, the army establishment was reduced. As a preliminary step, the 95th Regiment was withrawn from the regiments of foot line (becoming the Rifle Brigade) in 1816 which caused the higher numbered regiments to slip down one number in the order, while retaining their "county" names. As a result the 100th Prince Regent's County of Dublin became the 99th Prince Regent's County of Dublin, taking the number of the previous 99th (Prince of Wales County of Tipperary) Regiment who became the 98th. The new number lasted for less than two years, for in 1818 the higher numbered regiments were disbanded - the "99th" in July 1818 while stationed in Quebec City. The "County" titles usually, but not always, refer to the normal place of the regimental depot . The regiment had a home base in the British Isles and a recruiting and training depot was maintained in the old country when the regiment was on campaign to continue to recruit and train soldiers who would be shipped at intervals to join the regiment. When you consider the high mortality rate (more from disease and accidents than from enemy action in battle) and the fact that as many as 10% of the men deserted annually while on station in Canada, the necessity of maintaining an active depot is apparent. For the 100th, many of the new recruits came from Ireland and it seems from the research completed by descendants, most of these were from County Fermanagh where a depot was maintained in the county seat of Enniskillen. To this were added "drafts" and transfers from other regiments as well as a number of unfortunates who fell victim to the occasional "press" when other means of recruitment were inadequate. During the course of the Napoleonic Wars the 95th Regiment became a rifle regiment and when merged with the 60th Regiment, became the Rifle Brigade. In 1816, with the 95th now taken out of the Regiments of Foot line, there was now a "gap" in the numbering system and the regiments were renumbered so that the 96th became the 95th; the 97th became the 96th; the 98th became the 97th; the 99th became the 98th Regiment. the 100th became the 99th, and the 101st became the 100th. All of the re-numbered regiments were disbanded in 1818 and all served in North America, adding to the confusion. The assumption is generally made that the 100th and 99th were amalgamated due to losses in battle. For example it is often stated that the Battle of Chippawaw Creek caused sufficient casualties to make a merger with another regiment a requirement. This is not the case. Only 27 men were killed in that battle, which took place in 1814, two years before the re-numbering process. None of the regiments were merged. With the end of the hostilities by 1815, Britain began a consuiderable reduction of the army and some regiments and many second battalions of regiments were disbanded, leaving soldiers stranded and the officers on "half pay" throughout the empire causing incredible unemployment levels. A concern of the British was the prospect of large numbers of trained, unemployed ex-soldiers returning to Ireland or England. The plan for demobilised units in Canada was to offer land grants in Canada on " military settlements" such as Perth, Lanark and Richmond in Upper Canada. The Richmond settlement was comprised of men and their families,who had served in several regiments, but primarily those of the 99th (ex-100th) took up the offer. In addition, soldiers in attached units - such as the Royal Sappers and Miners and Royal Artillery - received the same offer. The British Army decided that a major role of the demobilized soldiers would be to form a force-in-being to withstand any future incursions from US forces. This would ease the problem of maintaining a large force of regular British troops in the colony, an expensive option, or face the delay in getting troops from other empire stations to Canada once the regular force was reduced. Creating "military settlements" along a wilderness defensive line was conceived to protect the vital Ottawa River communications link on the assumption that the St. Lawrence River itself was indefensible due it's length and continuous proximity to the US. This line of settlements would protect key points, and in return for land, basic supplies and a pension the soldiers would form the nucleus of a militia that could at least delay the progress of invading forces in the gap that existed between forts in Kingston and Chambly. To this end the military settlements of Lanark (1816), Perth (1816) and Richmond (1818) were created - arrayed near the length of the planned canal that would eventually connect Kingston and Montreal via the more protected route of the Ottawa River. With the disbandment of the 99th Regiment (ex-100th) in 1818, the army tried to move quickly to get soldiers into the assigned area. A surveyor, Joseph Fortune, was dispatched into the wilderness beyond the Chaudiere Falls on the Ottawa River, and a militarily acceptable location was conceived astride the small Goodwood River, roughly 20 miles inland. The intended settlers first moved from their Quebec City base to Montreal. Lt-Col. Francis Cockburn (Deputy Quartermaster in Canada) who was responsible for establishing the settlements, hurriedly moved the preparations forward to locate and provision the 400 in the party. However by July the group was stalled in Montreal, and time was running out on the endeavour. On July 17th , with a growing typhus epidemic spreading in the city, he ordered the settlement group to immediately move out of their encampment in Lachine and strike out for Richmond. As a result the settlers arrived in late August at Bellow's Landing (later Richmond Landing and currently Lebreton Flats) and set up a tent encampment before beginning the arduous task of carving a 20 mile road to the surveyed area before the harsh Canadian winter set in..However, it was December before a road was completed and a rough site at Richmond was ready. By then two members of the group had already succumbed to the Canadian winter. Initially the population grew as new settlers were directed to both the Richmond and Perth townships. However the surrounding land proved difficult to farm and many of the supplies had to be transported in from depots maintained in Hull. Initially the settlement was governed by both civilian and military authorities - an awkward arrangement that led to the dissolution of the military authority in December 1822. By 1820 12 general stores, 4 breweries, 2 distilleries, 1 sawmill, grist mill, carding mill and a town hall were in place. The town was envisioned as a major centre on an urban design encompassing 1600 acres. However, with the the start of construction the strategic Rideau Canal in 1826 many residents moved to the newly created Bytown to seek work. A description of Richmond in 1827 declared it was . “30 to 40 log houses, a small tavern with no roof. It is surrounded by swamps...strongly recommended as the paradise of Canada [it is the] Purgatory”. 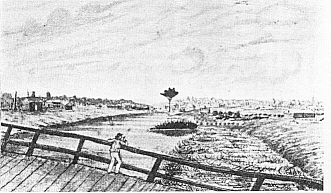 The opening of the canal in 1832 significantly reduced the importance of Richmond, particularly since the prospect an American attack had largely evaporated by that time. Bytown, later Ottawa, by virtue of it's location at the confluence of the Rideau Canal and the Ottawa River was ascendant at the expense of the original Richmond Settlement. The original land grant assignments can be found in the Land Record Index as Military Land Warrants in the Ontario Public Archives (there is an index by surname). Location of the grants themselves can still be easily found using the County of Carleton Atlas from the 1880s (available in most large public libraries) and a road map or by visiting the Ontario land records office for Carleton County in Ottawa. The Goulbourn Museum just north of Richmond is a new but quickly growing resource centre with a lot of information on the pioneers and their land. A list of known 99th Regiment privates who became farmers in the Richmond area can be found on the Bytown or Bust site. Children of soldiers were registered at the Garrison chapel, normally the closest Anglican parish to the place where that company was stationed. So that the Anglican Churches in Amherstburg, Niagara, Kingston, Montreal, Quebec, St. John's etc. are where these records are located (or of course the NAC). The place of birth is listed as the actual place of birth-: the parish in which they were baptized. The local Catholic, Presbyterian or Baptist clergy baptized those of their religion. Some of the Richmond pioneer's marriages took place at the Cathedral of the Holy Trinity in Quebec City. The traditional story on how Richmond was named goes as follows: In July, 1818, the settlers from the old 100th Regiment, embarked at Quebec en route for their new home. As they left that city, H.M.S. Iphigenia passed them, amid the thunders of a salute from the guns of the Citadel. She bore the new Governor-General of the Canada, the Duke of Richmond, and the loyal soldier-settlers resolved that the new town they hoped to found in the west should bear the name of the King's representative. However, that story is almost certainly apocryphal. Andrew Hayden (Pioneer Sketches in the District of Bathurst, pg 61-63) found a letter dated July 17, 1818 which Colonel Cockburn had written to the Governor's Secretary regarding the arrangements for the soldiers of the 99th. In it Cockburn already refers to the lands at the "Richmond" settlement. Ironically, the Duke himself decided to pay a visit to the new settlement on his return to Quebec City. Just before arriving there he was bitten by a rabid fox and died just short of Richmond. He was transported to the Ottawa River through Richmond on his way to be buried at the Cathedral of the Holy Trinity, the Regiment's parish church in Quebec City. The Royal Military Artificers were the workmen of the army, a "pioneer" corps who constructed trenches, fortifications, etc. In 1812, the Corps was renamed "Royal Sappers and Miners" because of the primary function of building "saps" and "mines" for siege warfare. In 1856, they were absorbed into the Royal Engineers with whom they had always functioned. There were, of course, Royal Sappers and Miners in Canada throughout the 19th century and they can also be found in the Richmond and Perth settlements.